Is your mom the kind of mother who would appreciate a custom-designed smartphone a lot more than another floral arrangement? Motorola's got just the deal for her, with $100 Moto X Pure Edition savings. Motorola's offered plenty of recent discounts on the Moto X Pure Edition, like the Amazon deal last month that gave you $50 off the phone's 32GB model (while forgoing the option to configure the phone's look yourself in Moto Maker), or the $100-off deal from back in March that was only good on the 16GB Moto X Pure Edition; if you wanted the 32GB model, those savings dropped to $50, and the 64GB version remained at full price. 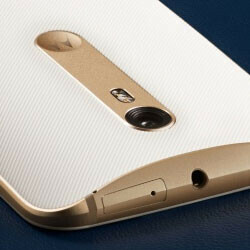 For Mother's Day, though, Motorola is getting rid of all those restrictions. Not only are you free to give the phone that one-of-a-kind color scheme that will be perfect for mom, but you've got your choice of 16GB, 32GB, and 64GB storage capacities – all while getting the full benefits of Motorola's $100 discount. That brings prices for the phone with those three storage options down to just about $300, $350, and $400, respectively. The deal runs from today through the morning of May 9, giving you just about a week to make up your mind about what to get mom. With Mother's Day falling on May 8 this year, we wouldn't recommend dawdling unless you plan on giving mom an IOU. If Motorola phones just aren't your (or mom's) thing, T-Mobile has its own Mother's Day savings, with an LG G5 buy-one-get-one-half-off deal, free tablet offer, and a bunch of accessory discounts. Wonder why there's so many discounts for the Pure.